Those with their fingers on the pulse of the hot geek trends will already know a lot about 3D printing and all it has to offer, but the expense of burning through so much costly plastic can be off-putting. Enter the Filabot. 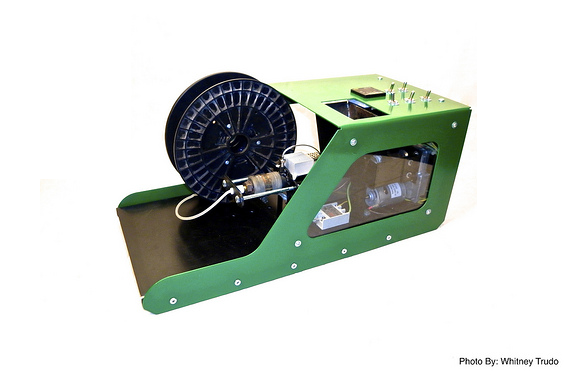 Originally developed by Tyler McNaney while he was at Vermont Technical College, it’s a desktop extrusion system that will take ordinary recyclable plastic found in the average household—milk jugs, soda bottles, whatever—and make them into grist for the 3D printing mill. If it’s HDPE, LDPE, ABS, or nylon, then Filabot will shred it up and feed it to your 3D printer (sorry PVC, but there are some toxicity issues with home-recycling as far as you're you’re concerned). If one of your printing jobs doesn't turn out so well, just throw it into Filabot, turn it back to filament, and print it again. Filabot trounced its Kickstarter campaign goal: It asked for $10,000 in funding and received $32,330 by the time it was over. Now, the flagship Filabot (the “Reclaimer”) is in production and will be available for purchase in the not-too-distant future, probably for somewhere in the $350 range. If you’d like to get your hands on one, head to the Filabot site and sign up for email notifications for product releases. Oh, and get your empty shampoo bottles ready. You’re gonna need them. This story, "Filabot turns recyclable plastic into 3D printing material" was originally published by TechHive.